Recently I have been out and about with Ralph all over the South West. My travels actually started in the West visiting our Batribike stockist in Upton upon Severn, at Severn Wheels. It was good to have a chance to catch up with Malcolm and to demo the tilting trike to some of his customers. The tilting Trike 20 is an ideal ride for those who are used to cycling but would prefer a more stable platform. The front end of the trike leans into corners just like a bicycle and feels very natural. 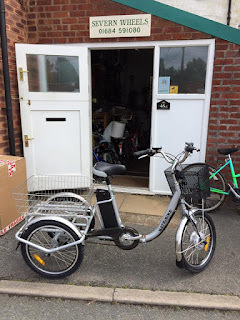 However if balance is an issue then the rigid Trike R is a traditional trike that rides exactly the same as a conventional tricycle, of course they both have the benefit of electric motor assistance. 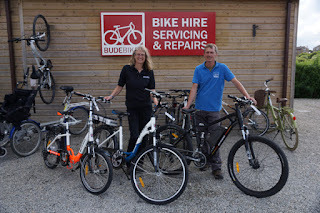 From there we travelled to Monmouth and I am delighted to say that Car Care is now a Batribike Stockist and will have our bikes in store very soon. 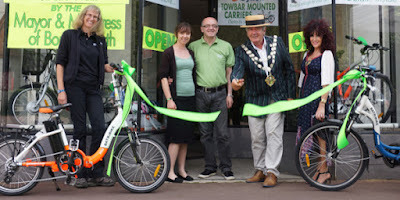 Car Care is a family business and it was a delight to meet them all and see them enjoy test riding the bikes up the hill in Monmouth High Street. The bikes sailed up the hill and it was amusing to see the lycra clad conventional cyclist having to stand on his pedals to make it up behind the seated Batribike riders. 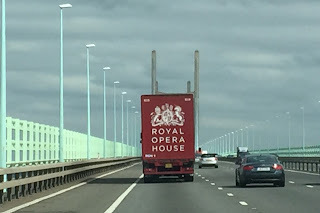 We crossed over the Severn Bridge behind the Royal Opera House lorry and headed down to Devon. 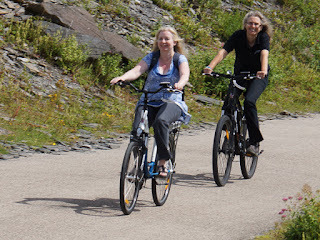 Thursday morning was free and so I took my friend to the ‘Camel Trail’ she hadn’t been on an electric bike before and I was keen to hear her impressions. Her husband is a keen cyclist, and the last time she had cycled there was quite hard work, she had stopped several times to recover. We parked at Wadebridge with the intention of seeing how far we could get towards Padstow before turning round. Well, I am delighted to say that we went all the way to Padstow! My friend didn’t need to stop, but she did – just to inform me that she didn’t have “jelly legs” like she normally does. The ride was an eye opener for her and the headwind on the way back didn’t phase her either. 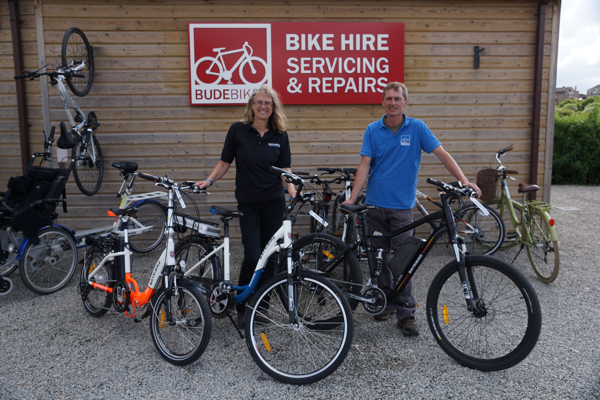 In the afternoon we visited Bude Bikes, who I am please to say are now an official Batribike stockist with bikes in store. I again demo’d the tilting trike. The 80 year old lady didn’t want to give her age to start with as she was worried that we wouldn’t let her ride. Her confidence and determination was very inspiring and she rode perfectly, she is now looking forward to the new independence the Trike 20 will bring her. Friday took us to Topsham, a delightful town next to Exeter right on the riverside. 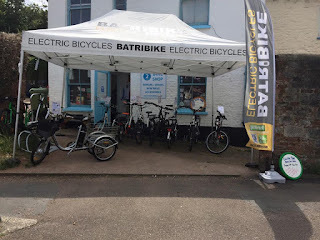 Batribike stockist Route 2 Bike Shop, which is next to Topsham Quay had an Electric Bike Day. We took along our gazebo, flags and a variety of Batribike models and had a lovely time talking to everyone who attended. Saturday was the last day of our tour and we were in Bournemouth for the Grand Opening of the e-Cycles Centre. Owner Colm Boyle had arranged for the Mayor and Mayoress of Bournemouth to ‘cut the ribbon’ and had laid on some lovely refreshments. 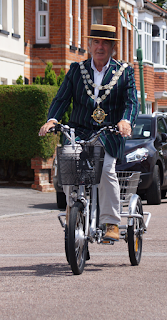 Once again we had a great day and enjoyed seeing the Mayor riding the Trike. 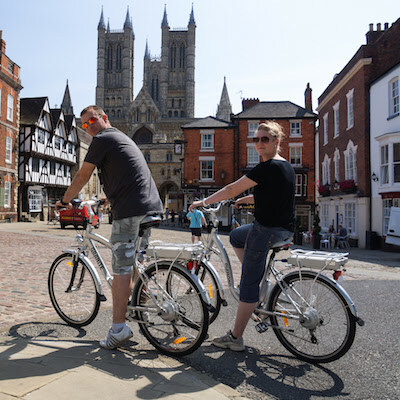 Summer has definitely arrived and everyone wants to be out on their bikes. Electric bike riders are no different and it certainly is a good time of year to enjoy being outside. If you have not used your electric bike for a while make sure that you check it over for any loose items. 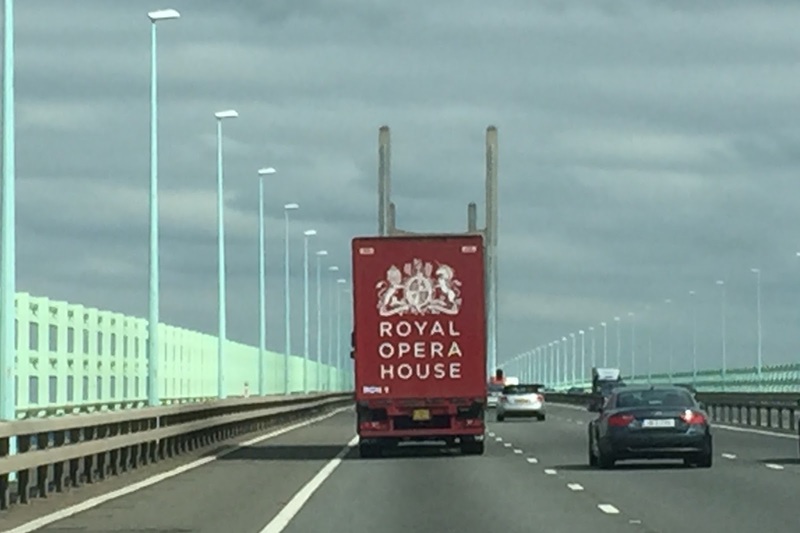 Make sure that the brakes are adjusted and working and that the tyres are inflated correctly. Under inflated tyres give less distance as they cause more drag. Much better to pump them up and ensure that you have enough power for the return journey. Charge your battery before you go, with the nice weather you can often ride further than you had originally planned or stay out later with the lighter evenings. In the hot weather it is important to think about your personal protection. Consider if you need to apply sun protection cream. 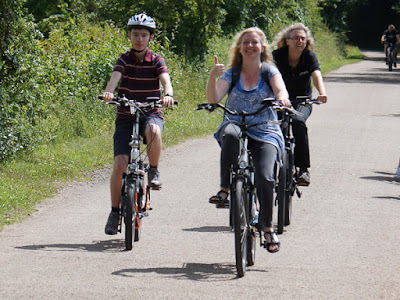 Gliding along on your electric bike can make you feel like there is a cooling breeze, please make sure you have adequate sun protection, you might not realise that you are getting sun/wind burn. Sunglasses are a must for summer riding, there has been a lot in the press recently about UV rays being harmful to eyes. Sunglasses also protect you from flying insects, there’s nothing more annoying than a bug in the eye! Stay hydrated. Riding an electric bike on assist is not likely to work up a sweat, but when the weather is warm you need to take on more fluids, so remember to take a drink if you are going for a longer ride. It is better to drink little and often rather than downing the whole bottle in one. Be prepared for summer rain. It is a good idea to take a lightweight waterproof with you, they fold up small and can easily fit on a rack. Above all, get out there on your electric bike and enjoy the summer.